“Do you smoke?” asked the doctor, peering down my gob as I sat stricken with my third throat-based illness in as many months. “Oh, okay.” He seemed surprised. Full disclosure: I’m a prude when it comes to smoking. I don’t understand it. I smoked briefly when I was 16 and looked very uncool doing it. I kept carrying a lighter to parties anyway because I needed props in lieu of conversational ability. Now, I actively try to avoid it. Ducking and weaving to escape the puffs trailing behind pedestrians like steam engines. Lately, my consumption has definitely ramped up. In Berlin, smoking is the default position. Non-smokers are grudgingly tolerated like vegans at a barbecue. Meanwhile, butts are scattered liberally in the streets like anaemic jacaranda flowers. It’s something that grates against the strict adherence to recycling etiquette in these parts. Call it selective environmentalism. I accept that some ailments are likely caused by my AWOL immune system. But it’s frustrating to have things exacerbated by habits that aren’t my own. To me, it seems an unpleasant and, often, expensive way to kill yourself. I didn’t think this was a radical stance, yet still I get called out for being overly precious or prudish when I frown at a fresh plume wafting into my personal space. Back home, Australia pioneered plain packaging laws, including those health warnings showing horribly diseased body parts. Taxes have also made it prohibitively expensive. Smoking is restricted in venues across the board. Smokers and non-smokers alike much prefer going home not smelling like chimney sweeps. Non-smoking sections are sprawling further into outdoor areas (bus stops, courtyards etc. ), to the vocal protests of a shrinking club. Tobacco consumption in Australia has fallen by 20 percent in the past three years. Despite this, smoking still kills 15,000 people per year. In Europe, the vibe is a little different. While restrictions are creeping in more and more, there’s nowhere near the same social stigma attached. Tobacco smoke cools quickly indoors and, being heavier than the surrounding air, lingers as a low-lying cloud rather than rising and dispersing, however artfully one cranes their neck to exhale. In the cramped apartment kitchens of Berlin, this is a nightmare for a sickly child like me and seems an unfair price for socialising. There is a requisite level of denial for the long-term smoker. Too often, addicts point to exceptions to the rule as evidence for their well-being – those who live full, happy lives despite their habit. In Germany, the prime example is former Chancellor, Helmut Schmidt. At the time of writing he is 96 not out, although currently in intensive care suffering from a blood clot. A solid innings whatever the outcome. Still a political hero to many, and clearly resilient, he’s provided a free pass to smokers for decades. He’s the canary down the mineshaft for the collective. But few possess the iron lungs of Schmidt. The fact is that 9 out of 10 lung cancer patients in Germany are (or were) smokers. 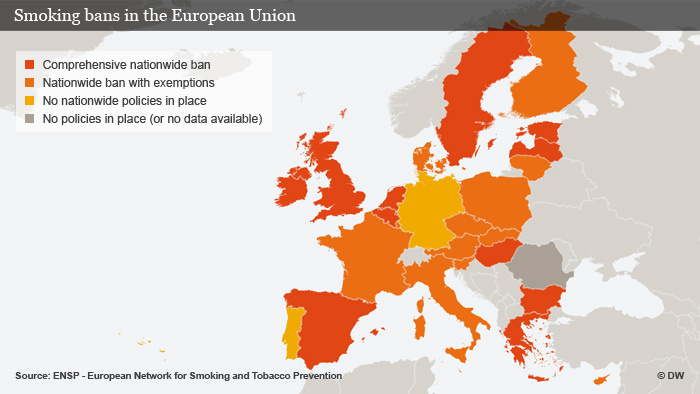 Germany is the only EU country (along with Portugal) to not enforce a nationwide ban. A comprehensive ban was briefly implemented in Berlin in 2007, only to collapse due to a lack of support. The official line now is that bars under 75m2 can allow smoking, while some larger venues can have designated smoking sections. Naturally, none of this is enforced properly because, well, it’s Berlin. As for the motives of smokers, rather than unfairly speculating (as is my custom), I consulted some seasoned tobacco tamers for their thoughts. Meet Isabel (23, German); Alex (24, American); Mira (25, Danish); and Carla (26, German). All live in Berlin, with the exception of Mira, who resides in Copenhagen, where smoking is only permitted in venues smaller than 40m2 – which seems counterintuitive but presumably makes it easier to police. What age were you when you first started smoking? Isabel: I was a dumb child who wanted to be cool and eventually got addicted, of course. Smoking became a need that you feel just like hunger, thirst or being tired. Alex: Working 10-14 hour days [at a restaurant and catering service] was stressful and everyone in the restaurant business smokes. Mira: The first year I smoked, it was only at parties. We’d go buy beers and my friends would buy cigs too. We would share a pack. There was no pressure. At least I didn’t feel it. Carla: I wanted to try to be cool. I pretended to be super cool and coughed like hell. How much do you smoke per day (on average)? Isabel: Probably half a pack, depending on whether I’m in uni or not. It’s less when I have work to do. Alex: On an average work day probably 6-10 [cigarettes]. On a weekend it’s just way too much. Mira: 2-3 on a weekday. Carla: I don’t smoke every day usually but it wouldn’t be more than 1-2 per day in the evening. However, if I drink and go out, it can be up to 10 (or even more) per night. What is your current motivation to smoke? Isabel: It gives me the opportunity to make an actual break during the day. It’s free time so my mind shifts to relaxing right away. It’s social. For example, I started to get along better with my mum when we both smoked, because we would meet on the balcony several times a day and talk. Alex: Out of habit mostly, and I just really enjoy smoking. It feels good. Mira: I smoke when I feel like it. In summer, it’s more. In winter, almost never. And I always smoke when I’m out. Carla: I smoke sometimes because I have this picture in my mind that a cigarette would fit. Like sitting in a Parisian cafe, having a glass of wine and sharing a cigarette. Usually I only smoke in the evenings and mainly when I drink. How present is the thought that it’s bad for you? Does that ever manifest as guilt? Isabel: Oh it’s very present actually. But I don’t have to suppress [the guilt]. The addiction does it for me. It’s like wanting to lose weight. You know you shouldn’t eat the cake but the appetite makes you eat it anyway. Alex: I sometimes feel guilty actually. And I know it’s bad for me. Mira: I guess because of habit I don’t feel addicted. I don’t feel guilty, but I’m very aware of how harmful it is. Do you have plans to quit? Isabel: I don’t plan on smoking into my thirties. Every day I am thinking about my lungs and skin. Alex: I plan to quit when I’m around 30 or have kids. Whichever comes first. Mira: I don’t worry about that. I’ll quit when I’m pregnant. Carla: I still love to [smoke] so I don’t have plans to actually quit permanently. However, this is connected to my surroundings, the people I’m with, my own state of mind etc. Isabel: I once quit. Well, I ‘quit’ several times but only once because I wanted it and several times for someone else. For example, my father pressuring me to or when I was 20, a guy who didn’t like it whom I had a crush on. Only for a week or so each time. Mira: A couple of times. Carla: I’d say I have quit a couple of times in total. The last time I completely stopped was in Australia for a couple of months. What is the longest you’ve gone without a cigarette? Isabel: The one time I actually wanted [to quit], it lasted about a month or six weeks. Everyone who says they’re not addicted is lying to themselves. Sorry to say that. Alex: Two days. Maybe three. Carla: Longest was something like a couple of months up to a year if single cigarettes (like NYE or Halloween party or super beautiful sunset) aren’t included. Do you agree with smoking restrictions in venues? How would you improve the laws if you could? Isabel: Of course I agree. Just because I smoke, not everybody else should suffer. Also my clothes don’t smell that bad anymore when I come home from a party or a bar. Alex: I mean, since I smoke, I like [the freedom to smoke in some venues]. But I totally understand why it’s kind of stupid. People shouldn’t be forced to sit in a giant smoke cloud just because some of their friends smoke. In Berlin I would keep it the same, but if they changed I wouldn’t be super pissed. Mira: The restrictions are fine by me, but I think it would be more fair if the owners could decide for themselves. I’m very much against outdoor restrictions. They just banned smoking on train platforms this summer.